Three goals in the last 16 minutes saw Oldham claim all three points against Crawley Town. It was an end-to-end game with both sides having chances to win it but it was a moment of quality in the 74th minute from Johan Branger-Engone which broke the deadlock before goals from Zak Dearnley and Gevaro Nepomuceno sealed the win. Gabriele Cioffi's men went in to the game knowing a win would mean they would leapfrog the Latics. And the head coach kept the same side who drew 1-1 at Bury last week with Machester United loanee Matty Willock on the bench awaiting his first start for the Reds. Oldham were on a run of three straight 2-1 defeats and make one change to the previous game with captain Peter Clarke back in the side. It was a bright start from Crawley but the final ball and touch seemed to be evading them. But the first shot on goal came from the visitors but Johan Branger-Engone's long distance effort went high and wide. David Sesay made a penetrating run after a superb ball from Josh Payne before Panutche Camara's final ball let him down after a break on the right. Reds were well on top but were struggling to find that clear cut chance - Lewis Young bombed down the right but cross was cut out before Gambin's pass to Young was a let down following promising move started by Morais. But it was Oldham who should have taken the lead when Mohamed Maouche found himself with space on the edge of the area but his low drive was well stopped by Glenn Morris. Young was booked on 35 minutes for a heavy challenge on Urko Vera as the game started to get a bit scrappy. Going into the last minutes of the half Oldham started to settle more and looked more dangerous. Branger-Engone showed some superb footwork to break into Reds box but Morris saved before the corner was cleared to safety. Oldham did have the ball in the back of the net on 42 minutes but Lang was offside before Sesay - Crawley's best player - spurned the home side's best chance. He and Young had swapped sides and it was the latter who passed to Camara who in turn released Sesay but he fired over when he should have done better. Reds came out of the blocks in the second half and some lovely one touch football involving Camara, Gambin and Morais saw the latter one-on-one but he was adjudged offside. The reliable Morris then saved at the feet of Lang in an exciting start to the second half. 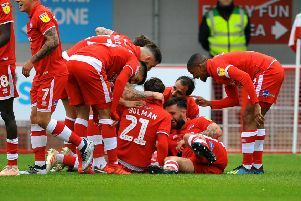 It was the final ball which was poor in the first half for Crawley but it appeared to be improving and Young sent a brilliant ball across only for Dan Iversen to get a hand on it with Ollie Palmer ready to pounce. It was Crawley who should have taken the lead on 55 minutes when Francomb's long ball bounced over the defence and Palmer lobbed the advancing Iversen only to see his effort go agonisingly wide. It was by far the best chance of the game at that point. But then Branger-Engone should have given the visitors the lead after he latched on to a Morris save, but Tom Dallison was on hand to clear off the line. The end-to-end nature continued and after Ashley Nathaniel-George replaced Gambin, Crawley again had another chance top break the deadlock. Young played a nice ball throuhg to Camara who showed great feet to beat two players but his effort with the outside of his boot was brilliantly saved by Iversen. But it was the visitors who did take the lead on 74 minutes. Dearnley made a great break but he was upended by Francomb three yards outside of the penalty area. Branger-Engone stood up and curled a lovely effort into the top left corner with Morris motionless. It was a lovely strike. Matty Willock then came on for his Reds debut, replacing Payne but he could not make an impact and Oldham doubled their lead on 86 minutes. It was Branger-Engone who made a break, running 40 yards before laying off perfectly for Dearnley who slotted home past Morris. Nepomuceno then added a third to condemn the Reds to a heavy defeat. The final scoreline was probably harsh on Crawley but their lack of a quality final ball that ultimately cost them. If that Palmer effort had gone in, it could have been a very different story. Paul Scholes wasn't at the game, but I imagine he was a happy man after seeing his side clinically finish off Crawley. SEE ALSO Former Arsenal midfielder Mark Randall leaves Crawley Town | Each of the 92 Football League clubs' average home attendance - ranked in order | Crawley Town v Oldham: Will Manchester United loanee make his debut for Reds?